Hikaru Shindo (Japanese: 進藤 ヒカル Shindō Hikaru) is the main character of the very popular manga and TV series Hikaru no Go. Hikaru, who at the beginning of the series is a sixth grader in elementary school, is nothing more than a easygoing boy. When he finds an Go board owned by his grandfather, Heihachi Shindo, Hikaru sees blood on it and faints. Later he finds out the spirit of Fujiwara-no-Sai is inside his mind. Sai pressures Hikaru into playing Go, and Hikaru becomes a strong Go player. Early on in his budding Go career, Hikaru becomes the rival of Akira Toya, an up-and-coming Go professional. Hikaru (while playing for Sai) defeats Akira in a Go game early on in the series. Akira becomes angered by Hikaru's victory and decides to chase after and become better than Hikaru. In the Special Bonus: the Haze Middle School Actors present Assassination at Honnoji Temple, Hikaru Shindo plays as Kashio Rigen of Honnoji Temple. Hikaru's mother is named Mitsuko Shindo, and his father is named Masao Shindo. Masao Shindo is largely absent from the household as many Japanese fathers do not have time to see their children due to work. Hikaru's voice actor (seiyu) in the Japanese version of the anime is the late Tomoko Kawakami. In the English version his voice actor is Samuel Vincent. However, this page uses given name first, family name last ordering to be consistent with Hikaru no Go manga published in the United States, Canada, France, Italy and Germany and publication of the anime in Western countries. It is hoped that this choice will facilitate the use of Sensei's Library by individuals for whom reading the manga is their first exposure to Go. The manga uses Western order naming with modern-day individuals and Japanese naming with historical figures. Perhaps the most prominent example of the historical figure naming is Murasaki Shikibu (Asian order) in place of Shikibu Murasaki (Western order). Murasaki Shikibu is the author of the famous Japanese novel The Tale of Genji. 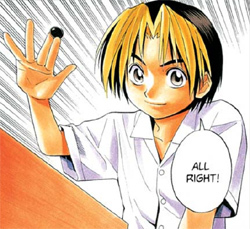 Chinese individuals (such as Lee Rinshin) have their names rendered in Asian order in the English-language version of Hikaru no Go. Korean individuals (such as Suyong Hong) have their names rendered in Western order. Hikaru's shoes are the same kind of shoes as Takeshi Obata's favorite shoes. Hikaru often wears shirts with the number "5" on them. "5," "go" (五) in Japanese, is a homophone of "Go" the game (碁). Hikaru Shindo - Suyong Hong Game - A game played by Hikaru and a Korean Go player named Suyong Hong.